From now until September 10th, the Academy of Motion Picture Arts and Sciences is holding a new exhibit of animatronic characters in movies. You can see such cinematic luminaries as Johnny-5, A gremlin from Gremlins, the arms Doc Oc used in the latest Spiderman movie, the little Men in Black aliens, and Alien vs. Predator in mid-combat. There are lots more characters being shown there so if you're in town, you might as well make a trip of it. 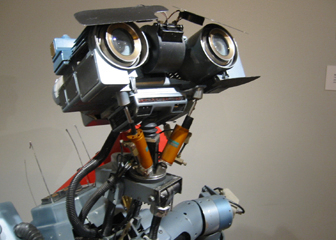 Who doesn't love Johnny Five?